To spice up my Birthday Bottle Kill event last August, I opened up two bottles and added them to the fray: Old Pulteney 21yo and Springbank 13yo Green. They wound up being the best things I put on the table. I've reviewed that Springbank already. It's time to talk about Old Pulteney 21 year old. In full disclosure, this bottle was sent to me by Amy of Ten27 Communications two years ago, which was outrageously generous. 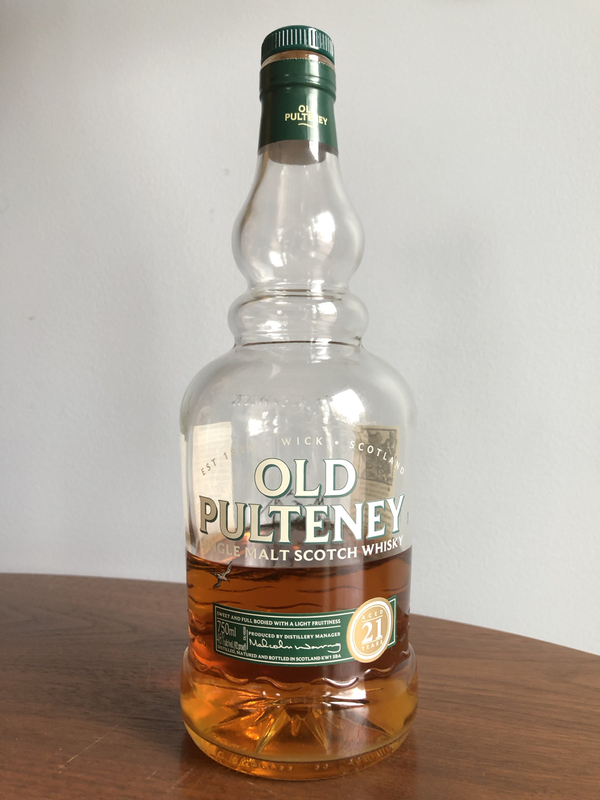 The whisky was already being retired by Old Pulteney at the time and it couldn't possibly require any additional positive reviews after The Fedora gave it his lordly stamp of approval. But, thank you, Amy! I haven't worn a fedora since prom night. Either I air out my monstrous fleshy pate or affix a Yakult Swallows cap when the sun is high. But I can and will lavish praise on this late whisky. Maturation: from the official site, "ex-bourbon casks with spirit from ex-Oloroso sherry casks. We mostly use second fill American oak, plus some Spanish oak first fill. However, there is a higher proportion of ex-Oloroso sherry cask compared to the 17 Years Old." The rich, complex nose starts off with anise, cantaloupe and cherry ice cream. Then, from underneath arises almost-smoky ocean air and dusty bourbon. After 30 minutes in the glass, there's raisin bread, honey, guava, orange peel, toasted oak and a subtle floral note. With a little bit of water, new notes of toffee pudding and sugar cookies appear. Then lemon peel and flowers. Orange pixy stix and berry jam. The silky palate is a spicy, honeyed thing. Lemon bars with mint leaves. Paprika, orange liqueur (minus the sugar) and melon. The sweetness and sherry casks stay subtle. No raisins nor prunes. With a little bit of water it gets sweeter and spicier. Bread pudding with golden raisins. More lemon bars. Bits of baking spices. It finishes with stone and citrus fruit, flowers and salt. Lots of oranges and limes. Mint candy and a slight serrano pepper bite in the back. It gets a little sweeter with a little bit of added water. Oranges, serranos and toasted oak. I don't fully blame Jim Murray for killing this whisky off. Those at fault are the "news" organizations who blindly announce The Greatest Whisky In The World every time some oddball with an unusual palate sends out press releases. See also, Yamazaki. It's not Fake News, it's Not News. While I adore Old Pulteney 17 year old, the 21 year old is (or was) something special. What struck me about the whisky is that it was excellent from the very first pour. I always (or 99% of the time) find the first pour from a whisky bottle to be very tight and narrow. This was luscious and perfectly balanced from the start. Because the price tag on the remaining bottles has bloated beyond reason, I'm just going to finish this bottle and bid this great expression adieu.